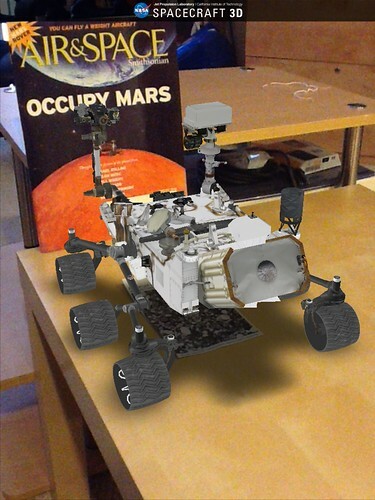 Speaking of Curiosity, JPL has made Spacecraft 3D, an augmented reality app for iOS that projects a simulated Mars rover onto your camera view. Just print out the 3D marker (embedded in the app and emailable from there as a PDF), place it on a flat surface, and point the camera at it with the app running. More of Mike Lee’s Spacecraft3D photos here. The app also does other famous NASA/JPL spacecraft. 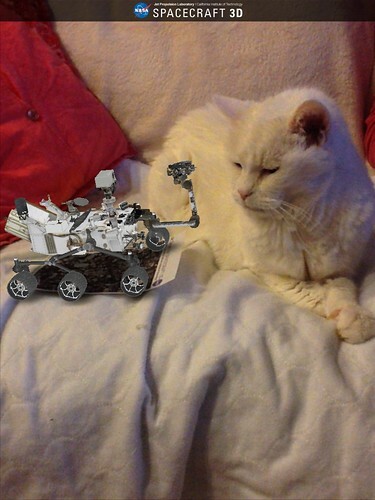 In case you missed it, here’s that iOS app download link again: Spacecraft 3D. And here’s JPL’s official press release on it from July: NASA 3-D App Gives Public Ability to Experience Robotic Space Travel.